Opelousas, La. ? The FBI has joined the investigation into a string of suspicious fires at historically black churches in Louisiana. Three churches have burned in less than two weeks in St. Landry Parish near Baton Rouge. Varg Vikernes, founder and only member of Norwegian Black Metal band Burzum, in his prison cell in 1998. On Wednesday evening, it was reported that Holden Matthews, the 21-year-old son of a Louisiana sheriff?s deputy, had been arrested in connection with a series of church fires in Louisiana?s St. Landry Parish. Matthews has been charged with three counts of arson of a religious building, which carry a maximum penalty of 15 years in prison per charge. In a press conference, Louisiana Fire Marshal Butch Browning confirmed that Matthews had a ?relationship? with the black metal community, which had an ?association? with church burnings. Matthews commented on memes featuring Norwegian black metal musician Varg Vikernes, a major figurehead in both the Norwegian black metal community and the neo-Nazi movement. The former bassist for the Norwegian black metal band Mayhem, Vikernes boasted about burning churches in Norway with other black metal musicians called the ?black circle,? which he attributed to his desire to take ?revenge? on Christians and bring Norway back to its pagan roots. He served 15 years in prison for arson and for the stabbing murder of his Mayhem bandmate Euronymous, whom he killed in 1993 over a contract dispute. Henkes is wary of attributing the Louisiana church burnings to Vikernes or to white supremacist views in general until more information emerges about Matthews and the case. ?I?m really hesitant to attribute a racist motive to it,? he says. ?On the other hand, it?s impossible to divorce these crimes from the greater context of the last few months.? There has been a tremendous rise in hate crimes in recent years, with the FBI citing a 17 percent increase in such crimes between 2016 and 2017 alone; houses of worship have been particularly vulnerable, as evidenced by the Charleston church shooting of 2015, the Pittsburgh synagogue massacre last year, and the Christchurch mosque massacre last month, all of which were committed by people with white supremacist views. Easter week and Notre Dame burns,nothing suspicious here. Paris' historic Saint-Sulpice Church was damaged by the fire which broke out on Sunday, but firefighters were able to bring the blaze under control. The blaze started around noon when four people were inside, with flames reaching the doors of the church and damaging the stained glass window above while smoke spread inside. "I have spoken with one of the people responsible for the church organ and was about to play, the group was up there and she said that she saw a man at the front of the church, who was yelling 'You are all crazy, you are all crazy', and at that moment we wanted to call the police and make a report to remove him, the fire started to light, the toxic fumes began to rise, and they had to leave immediately," explained Jessy, a local. PARIS (CBS/AP) ? A massive fire engulfed the roof of Notre Dame Cathedral in the heart of the French capital Monday, shooting up its long spire and sending thick plumes of smoke high into the blue sky as tourists and Parisians looked on aghast from the streets below. The cathedral?s roof has since collapsed, along with the spire. Now France know how feel when church are burning. There MSM never let him to see burned Serbian churches and monasteries on Kosovo in 1999. and 2004. because French soldiers were duty to keep them from Albanian Extremists. Orthodox monastery Devic ( 1434) burned by Albanian Terrorists in 2004. French soldiers saved nuns from Muslim extremists. 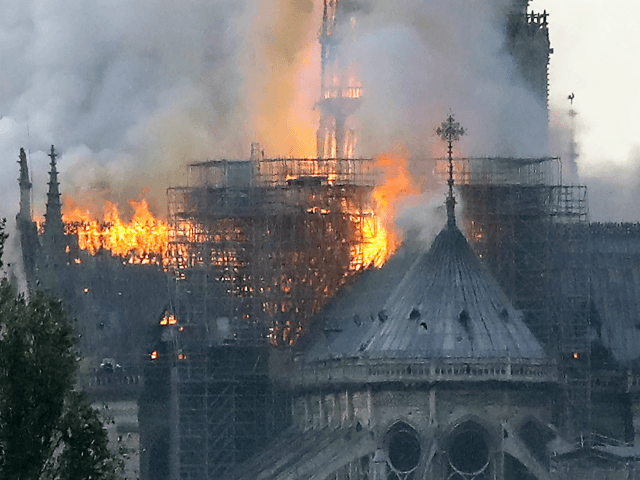 Initial reports in the French press suggested that many of those pieces had already been removed last week during the renovations, and Finot said that the cathedral?s collection of sacred items, kept in the sacristy, were likely unharmed. ?Normally there is no risk of things being burned,? he said. Later, officials confirmed that two of the cathedral?s most precious relics survived the flames: a tunic worn by Saint Louis, a 13th-century French king, and the crown of thorns that Jesus Christ is said to have worn before his crucifixion. It must somehow no longer be the case in the new and frenetic world of the internet-driven, 24-hour news cycle. That?s because a major international story ? one involving at least 10 acts of vandalism at Catholic churches in France ? went largely unreported (underreported, really) for weeks. The vandalism included everything from Satanic symbols scrawled on walls to shattered statues. That?s right, a rash of fires and other acts of desecration inside Catholic churches ? during Lent, even ? in a country with a recent history of terrorism somehow didn?t warrant any kind of attention from American news organizations. Even major news organizations, such as The Washington Post, were late to covering it and only did after running a Religion News Service story. This brings us to Monday?s fire at Notre-Dame Cathedral in Paris, where a massive blaze engulfed the 12th century gothic house of worship. It?s too early to tell if this incident is part of the earlier wave of vandalism, but it certainly comes at a strange time. For now, officials say the blaze remains under investigation. The cathedral has been undergoing some renovation work and the fire may ? repeat MAY ? have started in one of those areas. Fast-forward to present-day France. Crux was one of the first English-language Catholic news outlets to cover the phenomenon on March 28. While the article was accompanied by flames shooting through the front door of St. Sulpice Church in Paris, it wasn?t the reason why they wrote about it. It?s worth noting that St. Sulpice is a baroque church completed in 1870. It is also the city?s second-largest church, behind Notre Dame, and used in the movie version of The Da Vinci Code. Last Sunday, marauders set fire to the church of Saint-Sulpice ? one of Paris? largest and most important churches ? shortly after the twelve-o?clock Mass. Also in February, at Saint-Alain Cathedral in Lavaur, in south-central France, an altar cloth was burned and crosses and statues of saints were smashed. The attack prompted Lavaur Mayor Bernard Canyon to say in a statement: ?God will forgive. Not me. ?